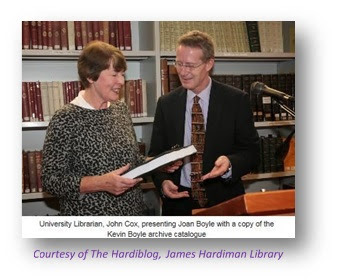 CONUL ANLTC Library Assistant Award 2016: An Extraordinary Life. 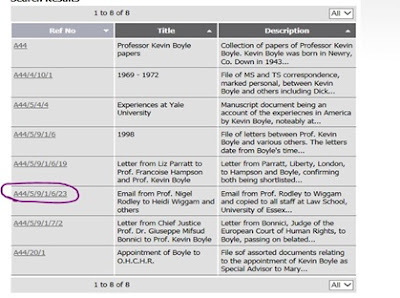 Discovering the legacy of Professor Kevin Boyle on CalmView - our Archives Search System. Discovering the legacy of Professor Kevin Boyle on CalmView - our Archives Search System. I click View Record. Scrolling through the description of the Archive, the full realisation of his legacy begins to sink in. This man has made a difference – on an international scale! It makes for exciting reading. I am anything but calm, as I try to decide, which area of his life to explore first! Would I begin with his role as Public Relations Officer with the Civil Rights Association in Belfast, and his membership of the group Peoples Democracy? Or would I explore his years as Chair of Law in NUI Galway, and the setting up of the Irish Centre for Human Rights? Governmental Organization, concerned with the defence of freedom of expression? Or what about his chairmanship of the International Committee for the Protection of Salman Rushdie? 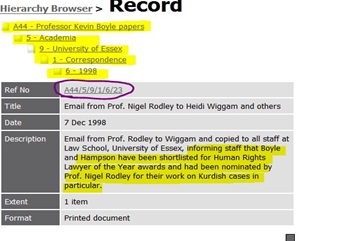 Could I leave aside his directorship of the Human Rights Department in University of Essex, during which time, he and his colleague, Francois Hampson, would be named UK lawyers of the year in 1998? Should I start with his observational reports, and research trips, for Amnesty International to Gambia, Somalia and South Africa? Or learn more about the year he spent as Special Advisor/Speech Writer to former President Mary Robinson, in her role as United Nations High Commissioner for Human Rights? Donnelly et al v United Kingdom – concerning complaints of ill treatment arising out of the emergency in Northern Ireland. Dudgeon vs the UK Case - central to the decriminalisation of homosexuality. Jersild v Denmark – involving freedom of opinion. In the end I begin with his years in NUI Galway, where he was the first full time member/professor of the Law Faculty. 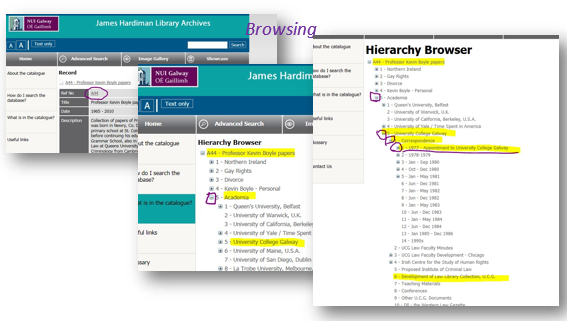 I click Ref no A44, opening a list of what this Archive covers. 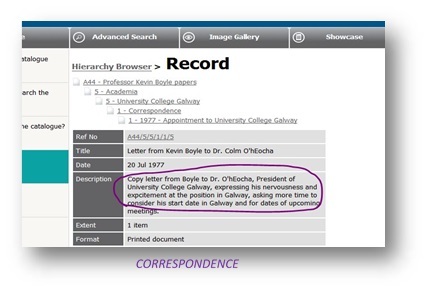 A box to the left of the Academia tab reveals a list of institutions, including University College Galway – as NUI Galway was known at the time. Clicking these boxes is an excellent way of browsing the Archive. 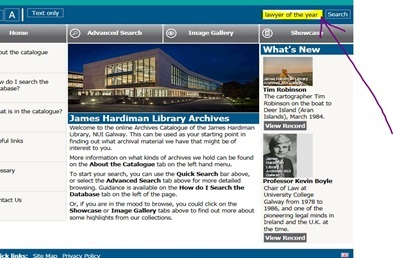 University College Galway opens another list. The box to the left of the Correspondence tab displays a list of letters. I am drawn to these letters. Sentences are isolated. 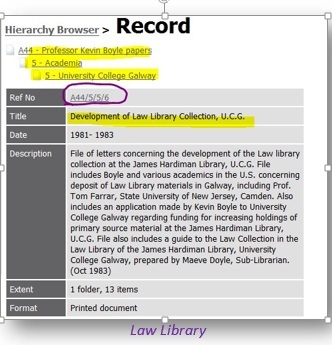 I discover how nervous and excited he is at coming to Galway, and setting up the Law Faculty (A44/5/5/1/1/5). Another sub-heading concentrates on his efforts in establishing The Irish Centre for Human Rights (A44/5/5/4/1). Further searching reveals his determination to get funding for our Law Collection (A44/5/5/6). I am on temporary transfer to the Law Library. I am learning to appreciate the special history of the area that I presently work in. I become more familiar with the breadth of this Archive. I type in Dudgeon in the Main Search Box. 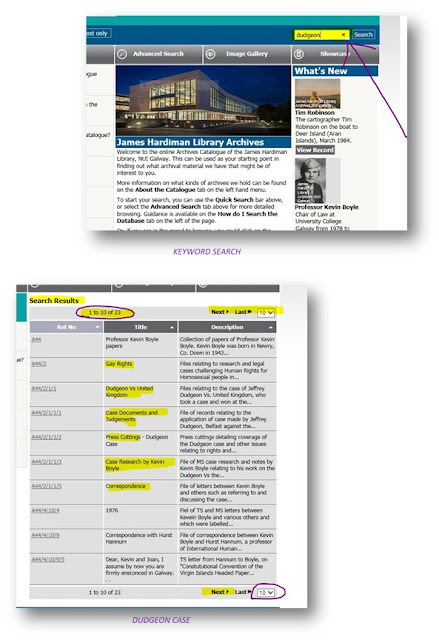 A wealth of information is displayed, such as Press Cuttings, Case Documents and Case Research. I type in lawyer of the year into the Search Box. Among the results, my eye is drawn to an email, regarding his nomination for UK Lawyer of the Year 1988 (A44/5/9/1/6/23). I read that Kevin and Francois Hampson received this award for their numerous against Turkey, on behalf of the Kurdish Human Rights Project. These prosecutions would become material, for both scholars and practitioners, in International Human Rights Law (Rodley, 2011). Among his publications is Ten Years On in Northern Ireland (Boyle, Hadden, Hillyard) 349.416.Boy. 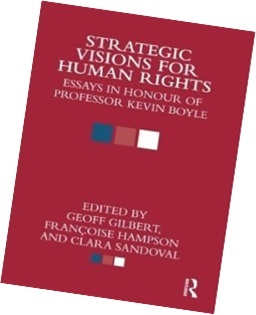 We hold a copy of Stategic Visions for Human Rights 341.48.STR, a Festschrift published in his honour by colleagues on his retirement from Essex. 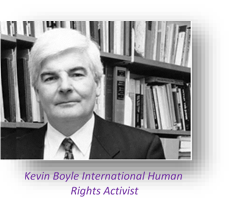 Sadly, Professor Kevin Boyle passed away on Christmas Day 2010 at the age of 67. 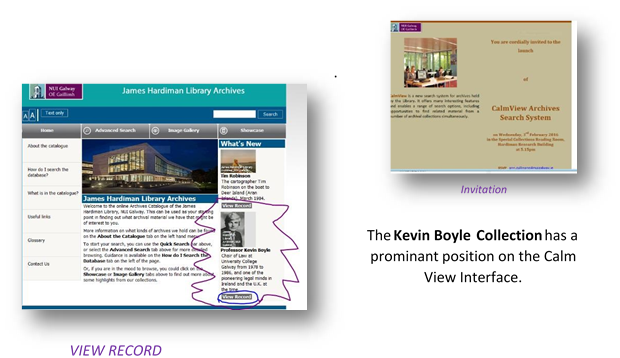 This blog is primarily an appreciation of the life of Kevin Boyle and the generosity of his wife Joan and sons Mark and Stephen, in sharing his legacy with future generations .It is also a salute to the power of digitisation, as after all – my journey started with just a Click! Rodley,N. (2011)’Kevin Boyle Orbituary’, THE GUARDIAN, 2nd.January , http://www.theguardian.com/law/2011/jan/02/kevin-boyle-obituary.